If you have two device, you can long press the "previous" button on any device to pair two devices together to enjoy stereo sound. Long pressing "next" button on any device can disconnect two devices. Phone without QI function needs extra QI receiver (not included). -It is for standard charging speed, only 5W, NOT for fast charging, so it won't overheat during charging. 【3 In 1 Bluetooth Speaker】It is a wireless bluetooth speaker w/mic, built-in 2-inch 16-core full-range high-fidelity speakers with 2pcs bass passive radiator, this speaker delivers truly immersive sound with a stunning rich bass, 5-6 hrs playtime. Also can be used as a wireless charger charges mobile phone while playing music or movies. A phone holder as well, non-slip rubber design, no worry of dropping out while charging, much easy to use. 【Technology TWS-ture wireless stereo】Built-in Bluetooth 4.0 technology, you could connect 2 speakers simultaneously without affecting the sound quality. Full-charging takes 3 hours. Compatible with most of Bluetooth devices, the surround stereo of speaker will bring you crystal clear Hi-Fi sound experience. And it also can work with computer directly by the original cable. 【Wireless Charger-Full Charging】It takes 3-4 hours for a full charge at standard wireless charging speeds with dual MOS for overcharging protection. And temperature control design ensures device safe charging. Use a 5V 2A adapter/QC 2.0 adapter (NOT INCLUDED) or original adapters and cables will get a better wireless charger results. When charging process is finished, the LED indicator light will turn out. 【Universal Compatibility】Wireless speaker works with multiple devices like iPhone X, iPhone 8/8 Plus, Samsung Galaxy Note 8, S8, S8 Plus, S7, S7 Edge, S6, S6 Edge, Nokia Lumia, HTC Droid DNA(US version), 8X(US version), One Mini 2, Google Nexus 4, Nexus 5, Nexus 6, Nexus 7, LG G2(US version), G3 back shell, 4 contact vertion(US version), G pro, SONY Z3V, Z4V, MOTO Droid 5 and other Qi-Enabled devices. Note: cell phone without QI function needs extra QI receiver (not included). 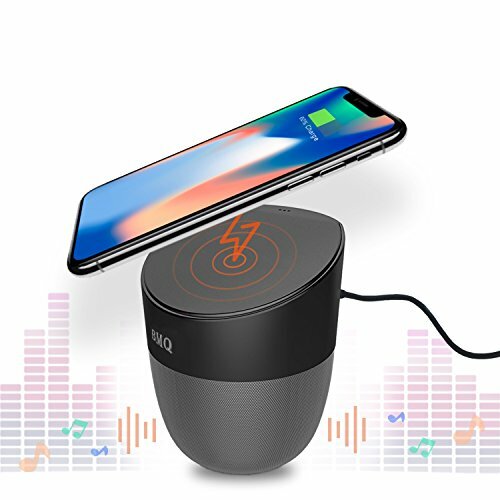 【100% Money Back Guarantee Warranty】BMQ bluetooth speaker with wireless charging comes with 100% money-back in 1 month and one year replacement guarantee, friendly customer service and life-time technical support. At BMQ, ZERO Risk purchase guarantee is for every customer's smiles. If you have any questions about this product by BMQ, contact us by completing and submitting the form below. If you are looking for a specif part number, please include it with your message.